Of the over 30 lasers and devices we use at Moy-Fincher-Chipps in Beverly Hills, our fractionated Erbium laser is one of the most popular, go-to devices to offer global improvement in skin texture, tone, and fine lines on the face, neck, chest, and hands. By removing surface skin damage, it treats photoaging, fine lines, poor texture, and acne scarring. 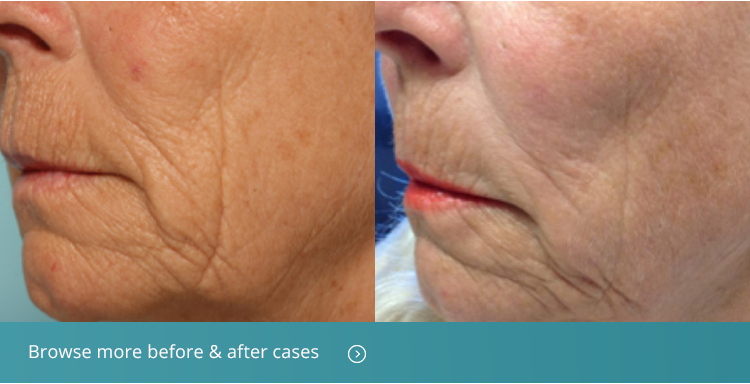 The fractionated erbium laser provides excellent results with less downtime and less discomfort than conventional fully ablative laser resurfacing, without compromising the outcome. It also offers better results than non-ablative laser treatments that don’t do as much to remove surface skin damage. Because this laser produces less bulk heat than other resurfacing lasers, it allows your dermatologist to gently and comfortably eliminate damaged skin layer by layer. It also causes less post-operative redness and swelling, which provides a more rapid healing process for you. Because the Erbium laser is gentle on the skin, it can be used successfully and safely for people with light and darker skin tones. What is a fractionated erbium laser treatment used for? Fractional erbium laser resurfacing is an anti-aging treatment that refreshes and rejuvenates your appearance. Fractional laser resurfacing produces significant improvement of acne scars, reverses sun damage, successfully removes superficial wrinkles, increases skin thickness, and improves skin tone and texture. How does fractionated erbium laser work? This fractionated ablative laser breaks up its laser beam into a grid of tiny beams that create microscopic injuries to the top layer of skin. Because only a “fraction” of the skin is treated at one time, healing is more rapid and downtime is less. The micro injuries stimulate new collagen and elastin production for skin remodeling, ultimately smoothing and evening outskin texture and tone..
Because this laser creates micro channels in the skin, the laser can be used to deliver topical products like growth factor serum or platelet-rich-plasma (PRP) more deeply into the skin for enhanced rejuvenation. Who is a good candidate for fractionated erbium laser? Patients in good health who desire skin rejuvenation with a shorter recovery period. Moy, Fincher, Chipps has three dermatology clinic locations in Beverly Hills, Fullerton and Torrance, CA. It works best for patients with superficial and moderately deep lines and wrinkles who have sun damage, brown spots and/or acne scars. In most cases, patients are fully recovered and back to normal activities within 3-5 days depending on the area treated and the energy used. Studies show consistent improvement of lines, wrinkles, photodamage and scars for up to 6 months after treatment. Initially, there will be some swelling. Within less than a week you will see new pink skin that is softer and younger looking. Your cosmetic surgeon will provide you with specific post-treatment instructions that are important for your best outcome. Post-treatment, it is important to wear sun screen because your skin may be more sun sensitive as it’s healing. Fractional erbium laser resurfacing is an excellent treatment that offers many of the same benefits as tradition laser resurfacing with less downtime and minimal risks. At Moy-Fincher-Chipps we offer our patients the most effective, least invasive treatments and technologies available to enhance your beauty, while addressing your specific concerns. As with all cosmetic procedures, the skill and expertise of your cosmetic surgeon will determine your outcome. At Moy-Fincher-Chipps in Beverly Hills, we have the skills, experience and expertise to deliver superior, personalized results to boost your self-confidence.